The film starts by depicting a beautiful relationship of two best friends and brothers . One is a Jewish nobleman, Judah Ben-Hur and the other his adoptive Roman brother Messala. Whilst racing , Ben-Hur is hurt and Messala carries him back to their family home in Jerusalem. Despite being loved by Ben-Hur’s sister Tirzah and mother Naomi, Messala still senses alienation in his adopted family. He enlists in the Roman army and fights many battles. Ben-Hur develops feelings for the family slave Esther although disparity between their status’ prevents him from marrying her. However, when a roman asks for her hand in marriage Judah declares his love for her (What a Babe). Three years later, Messala returns now a Roman officer. There’s an uprising by the Zealots, who detest the oppressive nature of Roman rule. Judah treats and shelters a young Zealot youth named Dismas. Messala reconnects with Ben-Hur and attempts to convince his adoptive brother to serve as an informant. Days later, Pontius Pilate marches into Jerusalem with Ben-Hur and his family watching from their home. The young boy who Ben-Hur saved attempts to assassinate Pilate with a bow but fails. The Romans break into Ben-Hur’s house arresting him and his family. Ben-Hur takes responsibility for the assassination attempt and is sentenced to enslavement aboard a galley. His mother and sister are sentenced to be crucified.As Ben-Hur is being led to the galley, he encounters Jesus, who fetches him some water. Ben-Hur suffers five years of torturous slavery as a rower aboard a Roman galley with scars to prove this! During a naval battle his galley is destroyed, managing to cling to a floating mast he is washed ashore and found by Sheik Ilderim . Through convincing , Ben-Hur manages to stay alive and aid the Sheik in healing his horse and preparing the chariots.Ben-Hur and Sheik Ilderim travel to Jerusalem to take part in a grand races at the newly built Roman circus. He meets Esther yet their circumstances keep them apart from one another. Ben-Hur confronts Messala (punches him in the face a few times ) but is forced to escape when Roman soldiers turn up. Later, Ben-Hur encounters a former Roman soldier named Druses, who informs him that his mother Naomi and sister Tirzah are still alive. However, their reunion comes with an unexpected twist when Ben-Hur discovers his mother and sister have leprosy. 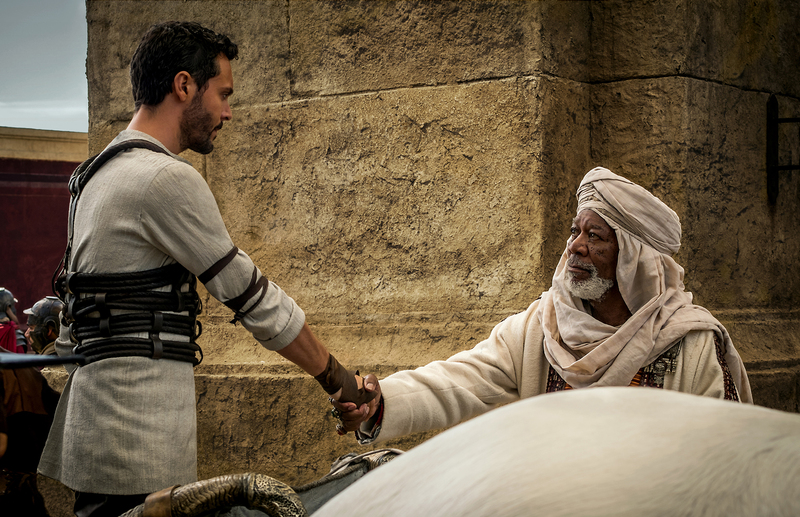 Sheik Ilderim bribes Pilate into allowing Ben-Hur to compete in the chariot races. Esther implores Messala to prevent Ben-Hur from racing but he is adamant to win. Following a gruesome race, Ben-Hur Finally is victorious. Messala manages to survive but is gravely wounded and loses a leg. Following Jesus’ crucifixion, a rainstorm occurs. Naomi and Tirzah are miraculously healed by rainwater, and Sheik Ilderim pays a ransom to set them free. Ben-Hur reconciles with Messala. Together, Ben-Hur & his family accompany Sheik Ilderim as they leave Jerusalem. Don’t look back , your whole life is ahead of you! Next Post What is becoming of the world?